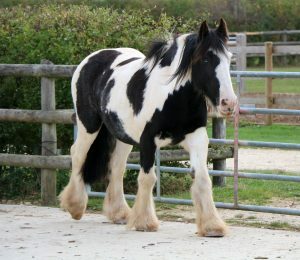 Jigily has moved fields so he can have a little more grass, which was great news for him! He has also said farewell to his friend Robyn, as he has moved to the Riding Barn where he will start to be backed as a ridden pony. Unfortunately, staff have found a few lumps that the vets suspect could be sarcoids. 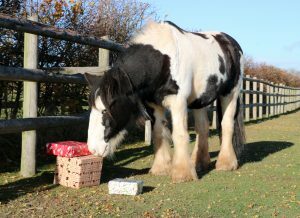 He is having cream on four times a day to try and help this but he will be monitored by staff and the veterinary team in the meantime. Jigily has been very pleased with the warm weather and has decided it is nearly spring by losing his winter coat by the wheelbarrow full. Staff are giving him lots of grooming time to help get rid of all the hair, but don’t worry he still has plenty left to keep him warm for when the sun isn’t shining! 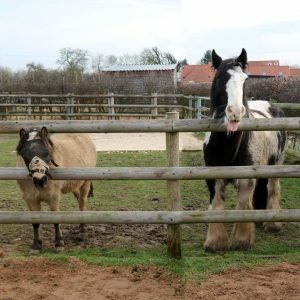 Jigily really is so cheeky! He is keeping the staff entertained in the morning by trying to steal his friend’s feed after he has eaten all of his own. He would clearly like some more, but the staff have to watch his waist line! Jigily is making the most of having the extra hay now that winter is here, although he and his friends are yet to work out the magic trick as to how to remove the naughty hay topper which slows their eating down! He is enjoying his new joint supplement, and staff are pleased as he appears to be much more comfortable and looking really well for having it. Jigily has started to feel the cold a little more this year and has a little bit of arthritis in his knees. To help him feel a little more comfortable, staff have changed his joint supplement. Despite this, he is doing really well and staff are very pleased with his weight and condition. 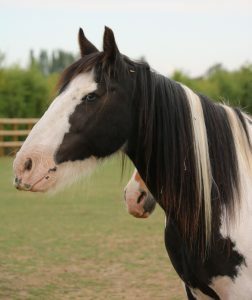 He is especially pleased with himself because he is allowed to have additional hay throughout the day with his friends. Although, he isn’t all that keen on the hay feeder topper which is designed to slow them down eating! Jigily has been having lots of fun with his friends, although a little bit too much fun it seems as he had a little cut on the end of his nose from one of his friends’ ‘playful’ antics. Thankfully it was only a nick and has healed up quickly, although the culprit is still unknown! Jigily provides the daily entertainment for the staff when they bring the hay tractor in every morning as he avidly follows the trailer, investigating for any sign of free hay and stealing it when he has chance, then running to the bottom of the field so he doesn’t have to share it. Jigily has had a routine saliva test this month to test for tape worm. Being the true gent, Jigily was very well behaved and even had to stand by while his friends had their tests just to show them how to behave properly. Jigily thoroughly enjoyed meeting his fans at the Autumn Fayre. He watched on as the staff busily prepared and set up the event and was stood patiently waiting for visitors as soon as the gates opened on the day. Jigily has lost a little weight, however this has actually been a positive as it seemed to ease his wobblers a little. He and his friends have a new sand pad which they are all enjoying, especially Jigily who has been seen rolling around in the sand many times. 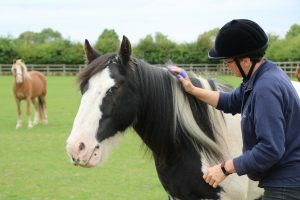 He has made a particularly good impression on a young visitor earlier in the month, who started to plait his mane over the fence and Jigily remained there enjoying the fuss until she had finished. 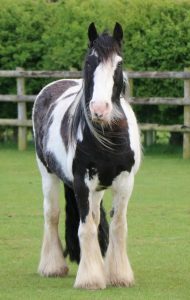 Jigily has been his usual loving and affectionate self this month with new visitors coming along to meet him through the Summer holidays. Many have fallen in love with his beautiful blue eyes and have hopefully even adopted him for the future! 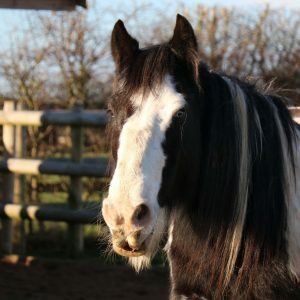 Jigily is well settled in his field with other adoption horses so we are sure he will be looking forward to the attention in coming weeks from visitors over the holidays. 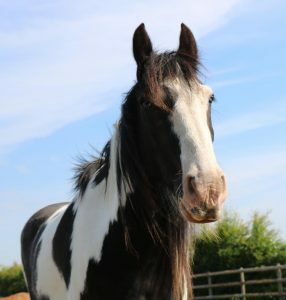 Jigily thoroughly enjoyed his adoption day where he received a lot of attention, especially from a married couple who came along specially to meet him. He has been enjoying a few more snoozes in the sunshine and his Wobblers Syndrome continues to be managed well by the welfare staff and will be regularly checked to monitor any changes. Jigily ideally needs a nose net to prevent sunburn on his nose, however there isn’t one big enough so he is having suncream on every day as prevention, which he doesn’t seem to mind as he stands very patiently while it is applied and of course for the cuddles afterwards! Jigily’s wobblers syndrome is being managed well and is much better thanks to the warmer weather making the ground a little harder for him. 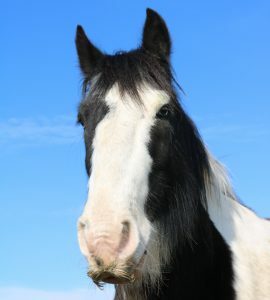 Staff have been busy pulling up the ragwort from his field as it is poisonous, and he has been on hand to lend a hoof! Jigily is always wanting to know what staff are up to and this was no exception as he followed them round everywhere they went inspecting they did a good job! Jigily has been enjoying the sunshine while it lasted! Staff grew a little concerned one morning when he was quite stiff, it was decided he was to have some pain relief and after being reassessed he was much better. 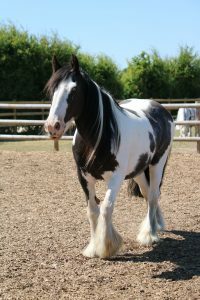 The warmer weather may have helped and he is looking forward to meeting new visitors over the summer. 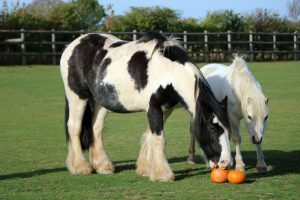 Jigily is enjoying a more peaceful life with fellow adoption horses Sparky and Digit. 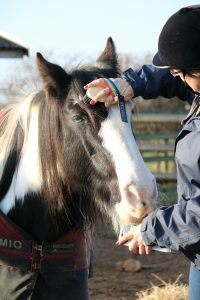 He has needed a little more support with the farrier as he is becoming wobblier, but staff are on hand to help balance him as he lifts his legs up for the farrier. 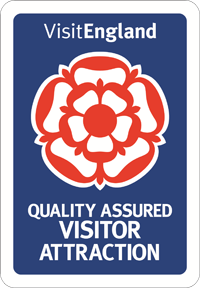 However, he has been seen laying down and getting up himself with ease which is a great achievement which staff are thrilled to see.